Opening of Jeremy Deller's retrospective exhibition at MUAC. I've always quite liked his work, but this time I really got it. Deller isn't an artist in the traditional sense. He doesn't paint or make sculptures, but then again nor do most Turner Prize winners. He does make videos, but they are really by-products. What he really does is document British culture, connecting its industrialised past with the 'creative/service' economy that now prevails and by, well, collaborating with interesting people. Which sounds simplistic but I can't think of a better definition right now. His re-staging of the 1984 Miners Strike's Battle of Orgreave was a bizarre work (part post-mortem, part 1000-person crime re-enactment). 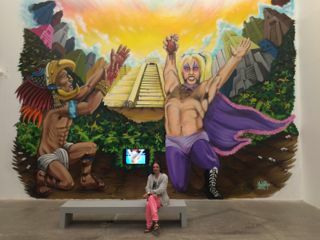 His fascination with the Welsh wrestler Adrian Street (seen here in full Mexican mural depiction) is also difficult to explain. And yet, if you allow yourself to be drawn into the story - and Deller is a great story-teller, straight-forward and very funny - then it all makes absolute sense. I was worried that a Mexican audience wouldn't get all the British cultural references (Brass Bands playing Acid Jazz; the homage to Keith Moon; morris dancing; his first exhibition in his parents' house, installed when they were on holiday...), but they seemed to. Nice lunch with him and others afterwards. A very unassuming and down-to-earth chap.